Behind a gate in the far corner of the garden, behind the garage is the most useful part of the garden. 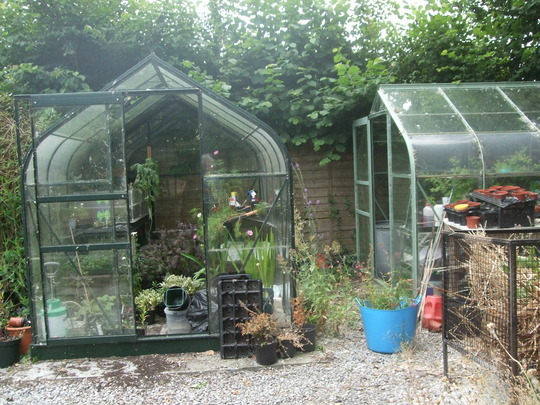 I have two greenhouses and a shed there, and racks where I stack flower pots, plus an old work bench. 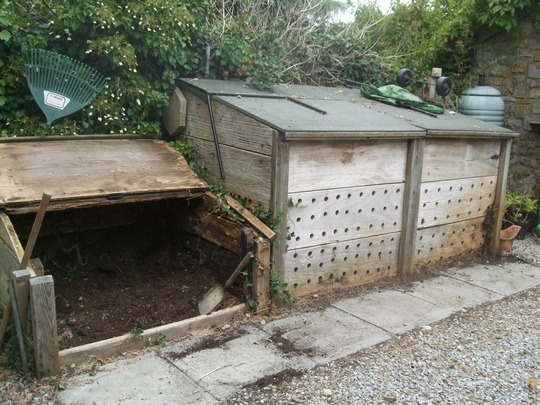 The row of compost bins is at one side, and an incinerator in the middle. We keep both mowers in this ‘compound’ which I suppose is the ‘work’ area. 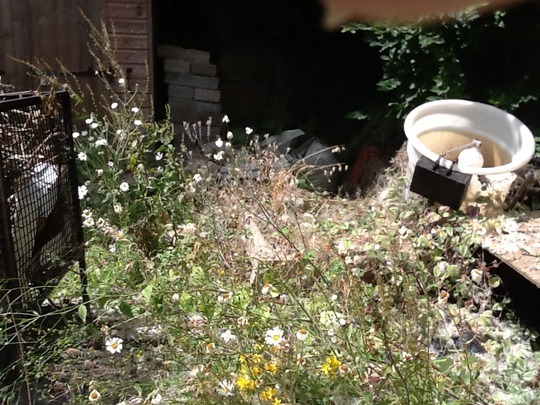 Unfortunately, it had got very messy with pots dumped instead of being neatly stacked; weeds had grown and not been dealt with and it was a disaster zone rather than a pleasant place to work. Why hadn’t I got busy and dealt with it? Well, other things got in the way, and it got so bad I just couldn’t face it. Then a friend told me about Dennis. Now, he is not a ‘gardener’ in the sense that he knows anything about planting or nurturing, but what he does is work very hard at such jobs as hedge clipping, cutting back large overgrown shrubs…and clearing. He agreed to come and deal with our mess of a compound, and my goodness – after two sessions he has made a tremendous difference! He is coming back for one more session, to cut back the awful brambles and ivy that come over the fence from the farm next door. 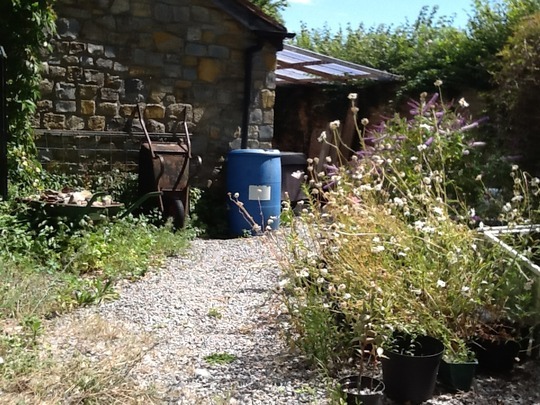 What a good job he’s doing – and it has spurred us on to bag up unwanted flower pots ready to take to the tip, and to try to keep the whole area tidy – as it used to be. Thanks, Dennis – you really are a hard worker. Previous post: Sad and happy. Next post: Everyone should have a Dennis! I know so many folk who could do with a Dennis, well done Spritz ? It has already been said, but a Dennis, is what we all need to tidy up behind us. He has done a wonderful job out there. This is such a lovely blog. I can see Dennis is certainly not a menace!! A good job done! Haha Paul. He's more of a wizard. ? What a find he is! that must be such a weight off your shoulders. Brilliant. 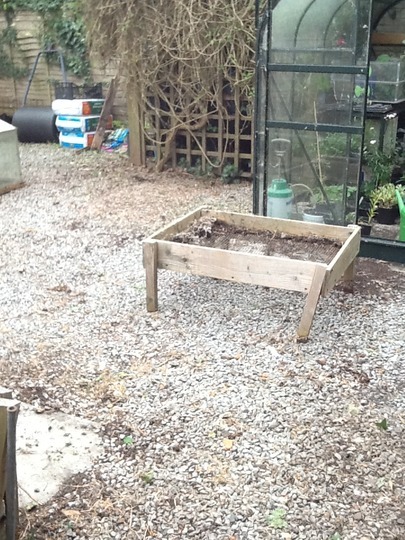 Well done to your friend for getting Dennis to tidy that area for you ... you must be feeling happy to see it cleared. I'm so pleased to see I'm not the only one with an out of control area! To be honest I am quite embarrassed about it. If only I had a Dennis to get things back under control - I'll put 'Dennis' on my wish list. an hour. 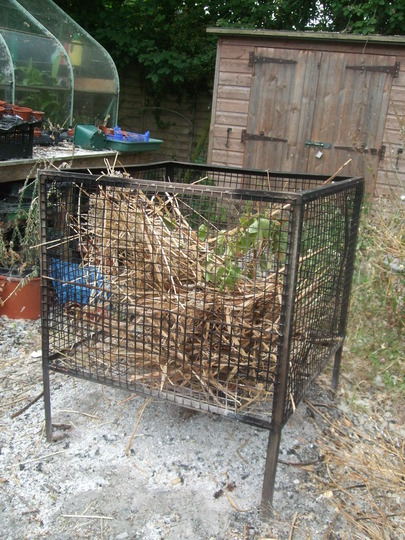 I employed one to dig out Brambles on my old allotment. I showed him the area I had already cleared. He kept coming down the path to show me a Bramble root he had dug up. When I went back to check he had dug the area I had told him not to. I didnt expect to have to stand over him while he worked. I didnt employ him again, £30 and I would sooner have done the work myself. So it just depends if you find a conscientious worker who will do as he is told. He charges £10 per hour, and I think he's worth every penny. :-))) Sorry your 'Dennis' turned out less of a hard worker, Diane. I do agree - every area should have a Dennis! Wow that is a really good price, the local handy man here charges £25 an hour. Wouldn't mind paying more then £10 but can't really justify £25. wow, send Dennis to me. £10.00 = $13.23 US. That's piece of cake. I'll throw in a Yankee game. that is a job well done. I wonder if Dennis does spare rooms too? 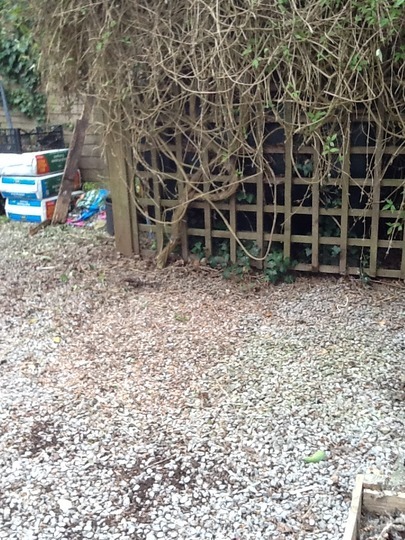 That tidy area will spur you on to keep it so, I know my shed is staying neat and I'm pleasantly surprised by it. I found a Maggie to help tidy my shed this week, that meant 2 more trips to the dump, but it is so nice to have one area looking neat.